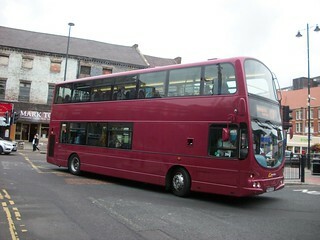 Following the end of the Sunderland Tall Ships event, this vehicle has returned to service at Washington Depot. 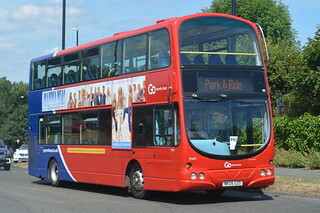 This vehicle has transferred from Washington Depot to the Special Events Fleet based at Deptford Terrace, seeing allocation to the Park & Ride services in operation for the Sunderland Tall Ships 2018 event, covering sites at Deptford Terrace, Downhill, Herrington Country Park, Fulwell and Stadium of Light. As this vehicle is fitted with an LED destination display, it is also expected to see use on the Tall Ships internal site shuttle. 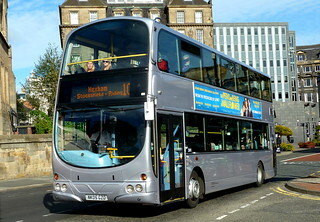 Following the cascade and repainting of the former "Tyne Tees Xpress" branded Wright Eclipse Gemini 2 bodied Volvo B9TLs onto the "Tyne Valley Ten" group of services; this vehicle, which previously formed part of the PVR of these services to accommodate service changes, has now transferred to Washington Depot. 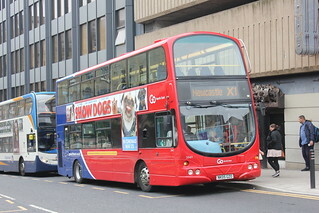 At Washington; this vehicle should act as a dedicated spare vehicle for "Red Arrows" service X1, and will replace a Scania N94UD/East Lancs OmniDekka currently serving this purpose at the depot. There were a number of changes to Go North East's services in the Gateshead and surrounding areas, from 24th July 2016. 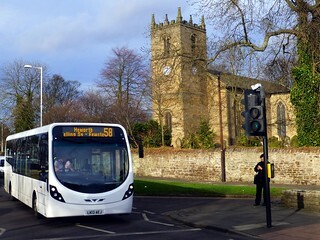 As part of these changes, service 10A was extended from Rockwood Hill to Blackhall Mill, which saw the PVR of the "TEN" group of services rise by one vehicle. 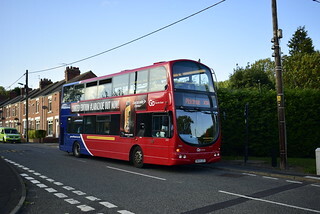 In addition, to allow a new bus to be scheduled from Hexham each trip off-peak, Hexham additionally gained a scholars service which was previously operated from Riverside. As such, this vehicle has transferred from Riverside Depot to Hexham. Having been deemed unsuitable for use on services 434/448 at Percy Main, this vehicle has returned to service at Riverside Depot. In a bid to provide a younger vehicle and improve reliability on the 434/448 services, this vehicle has transferred from Riverside Depot to Percy Main, replacing the current allocation on these services (3859), which has transferred to Riverside in exchange. This vehicle has received "TEN" branding. Following the entry into service of brand new Wright Eclipse Gemini 2 bodied Volvo B9TLs on "Tyne Tees Xpress" services X9/X10, this vehicle has been repainted into a silver base livery, and transferred from Gateshead Depot to Winlaton. 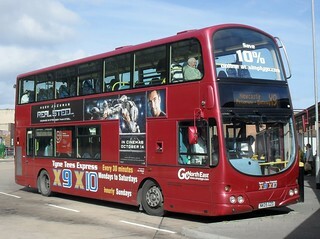 The vehicle will act as a spare, when the "TEN" group of services is converted to double-deck operation. 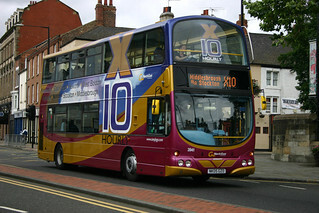 As part of a re-branding scheme for the X10 service, this vehicle has been repainted into a plain burgundy base livery. 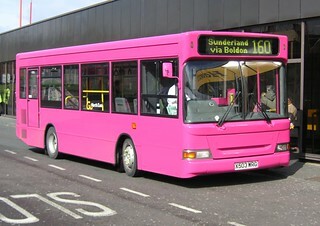 This vehicle has entered service at Gateshead Depot. 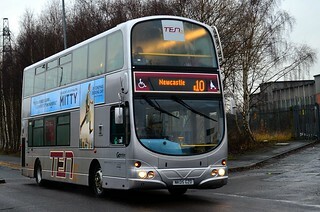 Prior to entry into service, this vehicle has received branding for the hourly X10 service (Newcastle - Middlesbrough). 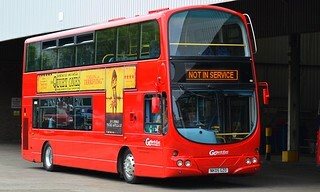 This vehicle, which carries a maroon, gold and blue base livery, has arrived into the Go North East fleet, and is currently being prepared for service. It features high-backed Esteban Civic V3 seating, in a special moquette depicting various landmarks around the North East. Having previously carried "Fast Cats" branding, this vehicle has been repainted into a plain blue base livery. 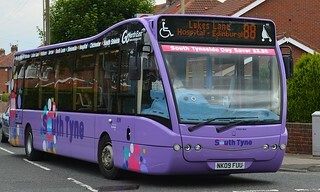 Allocated fleet number 9132 during its time at Go North East, this vehicle has now entered service at Gateshead Depot. 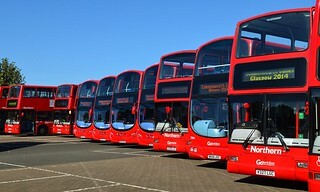 Following a period of driver familiarisation, this vehicle will see primary allocation to "Citylink" service 58.